You are a writer and a painter. You were born in Bulgaria, but you write in English. You have lived in Jerusalem for many years and you are one of long standing members of the English-language poetry group, Voices Israel. You have published six books of poetry. How long did it take you to get your first book published? It’s funny, but I am a late starter and my very first manuscript hasn’t yet been published. 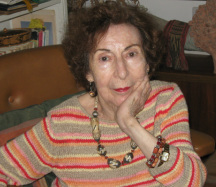 In the course of years I collected a series of poems, two collections in fact, that I wrote after the death of my husband, Gaby, in 1980, and was preparing them for publication. Then I traveled to the United States for a month’s visit with my daughter, Tammy, and I took the manuscripts with me. Invited to a dinner in San Francisco, by chance I met there the publisher of poetry books, the late Lou Servin. He read the manuscripts and offered to publish them immediately. I thought one was not quite ready for publication but my daughter insisted that I stay longer, and so I worked on it for another month, and then the two selections, Don’t Come Moon and Orbits were released together in 1999 by Artemghy Books. My third book appeared in 2006 in the United States too, when I was visiting my brother and he encouraged me to publish Between Panes of Glass. Diary of a Journey, a collection which includes my drawings and artwork, dedicated to my grandchildren, my niece and nephew, was published in 2011. Thirty years after my husband’s death, I felt a strong urge to publish the poems which I wrote right after he died. I didn’t change anything in this early manuscript, but added only three more poems written at a later date. This collection was published under the title, The Arctic Night. I am revising now Ribs and the Silver Mirror which is out of print. At what age did you start writing poetry? In what language did you write then? I started writing seriously after my husband died. Up to that time, I considered myself a painter, rather than a writer. But I was writing as a child. When I was eight years old I used to write little stories in Bulgarian for my friends. When I was thirteen I went to the American College in Simeonovo, an English-speaking boarding school in Sofia, the capital of Bulgaria. The boys and girls had separate classes, but we met while on kitchen-duty, an opportunity to exchange letters. I became known as “the writer” because I used to compose little poems and decorated notes in my class-mates’ names for their boyfriends. When we had homework assignments in English my friends asked me to write them too. How did you change from being a painter to writing more seriously? It was 1983, that pivotal year when my life was forever changed. I lay in hospital with a broken hip for two months and I wrote a lot while lying in bed. One day, my friend, Yehudit Isserov came to visit me together with her friend, Esther Cameron, the well-known poet and writer. Esther took a look at the notebooks on my bed and asked “what is this?” She took some poems from my notebooks and sent them to Reuben Rose, the editor of the Voices Israel anthology, who published them in the 1983. When I eventually left the hospital, it was Esther who insisted that I accompany her to Voices meetings, so I am grateful to her for discovering me and encouraging my writing. I was elected to the editorial board of Voices because of my years of experience in publishing, and I remained on the board for twenty years. You have traveled widely and you were educated in London, finishing your first degree – in History of Art –at the University of London, even though most Jewish families of means in Bulgaria sent their daughters to France or Germany to study. Although your English is excellent, was it difficult for you at first to learn English? Do you now think in English, or in another language? My father was a great Anglophile who insisted that I should be educated in English. In Sofia I had an English nanny, and while my cousins studied in French or German-speaking schools, I went to an American school, but this didn’t preclude my having to learn German and French, too! After graduating from London University I went to study History of Art in Italy. Then the War of Independence broke out in 1948, and I became involved with people from the camps in Europe. I came back to Israel for the war and was in the army, assigned to the Air Force because I knew English. We had to work with the American and British boys who were volunteering. I worked in Intelligence, composing codes and ciphers in English. So providentially, English became the language of my life. After I married I went to England again with my husband when he was on sabbatical leave, and I studied at the Cortauld Institute of Art in London. We returned to Jerusalem in 1968. My husband was working in Hadassah, and because I had to find immediate work, I had to abandon finishing my combined Masters and PhD degree. I started working in a publishing house as an Arts Editor. This way, I combined my love of art and my love of books. When the administration found out that I knew languages, they put me in charge of the Department of Rapid Translations, where I had to work closely with US commissions to translate books from different languages into English. So, yes, obviously everything that was happening in my life brought me to think in English, which is fortunate because I love the language and have an affinity to it. How did your work in a publishing house influence your work as a poet, if at all? insects, to maritime law, fisheries and rivers, cybernetics, botany and ecology. I had to sign the translated material before publication and I insisted on reading everything I gave my signature to. This acquaintance with so many subjects probably seeps through to explain the varied imagery in my poetry. My background is multicultural and I also traveled a lot. I seem to recall that you studied in the States as well? When my husband and I lived in Boston I had a small child to take care of, yet I still managed to attend lectures on art and literature in Harvard, an experience that enriched my life immensely. You are a painter as well as a poet and editor. How do you balance your painting with your poetry? On which do you place the emphasis? My mother was a gifted amateur painter and encouraged my painting and love of the visual arts. When we came back to Jerusalem after my husband’s Sabbatical in 1968, I could not continue studying but had to find a job, since the salaries of academics were too low to support a family. Also, my husband had many guests from abroad who were in Israel to deliver lectures or special courses, and it was my job to entertain them. Later, my husband encouraged me take a year’s leave of absence from my job and devote myself to painting, which I loved very much. By 1979 I was painting a great deal and was preparing to have an exhibition, but then my husband died quite suddenly in 1980, and the shock was so great that I found myself unable to paint. This is when I began to write seriously. I was obsessed after his death, writing and writing, but I could not touch a paintbrush. This was also the time when I moved from our spacious home in Talbieh to a much smaller apartment. I brought my paintings to an empty apartment next to mine; the owners allowed me to store them there, and I forgot about them. But at one point, a good friend, the painter Einat Argov, insisted on arranging an exhibition of my paintings at Café Ta’amon. Yet today the emphasis in my life is on writing. A big question: how does one manage to be a wife, mother, full-time professional, and still find time to express oneself? Look, I think that women artists in particular know how to manage so many things – husbands, children, housework, entertaining, jobs – everything. They have no choice; not that it is easy, but they do it. Which brings me to my next question – how much time do you, or did you, spend writing? How many poems a week would you write? These days I spend most of my time writing. I should spend more time not writing, and think more on revising my work. I keep a notebook next to my bed. In 2008 I had major heart surgery, which was not very successful. Before then, I was able to work better and publish more. But I was never good about finding outlets for my work. Anything can touch me… landscapes, beauty; also our everyday life…. I have a series of poems on Biblical figures. I write poems about Jerusalem – Jerusalem is deeply important to me. Which poets have had the greatest influence on your work? I like the Jamaican Nobel Prize winner, Derek Walcott and the Italian poet Eugenio Montale. A constant in my life is Rilke. I was raised on Russian and European poets. We had to learn Pushkin and Lermontov by heart, know the French poets, a smattering of Goethe and the classics. And of course the Bible. At one time I liked Gerald Stein a lot, Osip Mandelstam, Akhmatova. It’s difficult for me to know how much they influence my work. You used to mentor a group of young poets. Did you do this in a formal framework, or informally? Could you please tell me more about this? It was a very meaningful experience, very informal. A young man by the name of Jeremy came to a Voices meeting once and invited me to a reading of young poets who were writing in English. It took place in a basement; it was loud and funny, some played a banjo or a guitar. The whole group there adopted me, often came to visit me and brought me poems. I gave them suggestions and encouragement – they dedicated some work to me; it was very heartwarming. The group later moved to a bookshop on Schatz street but dispersed after Jeremy moved to India. What is your experience with being translated? I used to go to a class on Hebrew poetry. I also went to some Hebrew poetry meetings and they were fantastic. I was so happy just to sit there. The group translated some of my poems, and perhaps one day I shall publish them so my grandchildren can read them.. When I sat on the Editorial Board of Voices I sometimes included Hebrew poets who were translated into English. It’s more a dream than an actual project. I have a prose manuscript about my journey from Bulgaria to Israel that I would like to publish. Also there is a collection of poems, written before my husband died, that I’d like to publish, as well as the Hebrew poems that I just mentioned. Gretti, I pray that you will succeed in making your creative dreams into reality.